Mario Party 3 is the third installment of the Mario Party series, and the last one for the Nintendo 64. 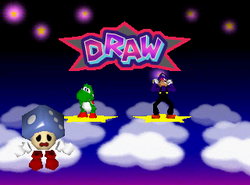 The game is centered around the Millennium Star, who replaces Toad as the host. The most notable change is that players can now hold up to three items instead of just one. The game includes 70 new minigames, as well as a feature unique to the Mario Party series: duel boards, on which two players fight each other using partners. The game is also the first game in the Mario Party series to have a solo mode story campaign. This is the first Mario Party game to feature a Story Mode and mini-games that could be unlocked and played anytime without purchasing them first, a system that has become standard and would continue to be used in future installments. This is the last Mario Party game to feature multiple minigame tracks for when there is just one winner, multiple winners and a new record. Mario and friends find the Millennium Star. Mario and friends are transported to the inside of the toy box. A Star is Born: In the center of the vast universe, a remarkably bright star was born. It was the star that is born only once in a thousand years, the Millennium Star. According to the legend, whoever possessed the mystical star was destined to become the Superstar of the universe. However since the Millennium Star was but a newborn, it fell from the starry sky. Around that time, Mario and his friends were all happily relaxing when suddenly the Millennium Star came crashing down. Mario and his friends soon began arguing about who should keep the Millennium Star. Suddenly, the Millennium Star gave off a brilliantly bright flash of light. And with that bright flash, Mario and his friends were transported into a toy box! "Greetings. I am the Millennium Star. You must pass my test to prove yourself worthy of possessing me. You must journey across many lands and collect the Star Stamps. If you can collect all seven, I shall accept you as the top Superstar in the universe." Who will collect the seven Star Stamps and become the universe's top Superstar? In the center of the vast universe, a remarkably bright star was born. It was the star that is born only once in a thousand years, the Millennium Star. According to the legend, whoever possessed the mystical star was destined to become the Superstar of the universe. However since the Millennium Star was but a newborn, it fell from the starry sky. Seeing this, Lakitu came flying in, dangling a toy box from his rod. That's right! They could play "Mario Party" to see who the biggest Superstar was! In Battle Royale Mode, players have to get as many Stars as possible. Stars can normally be obtained at a cost of 20 coins. In Duel Mode, players have to defeat their opponent with their partners. Each player starts with five heart pieces. In Story Mode, a single player must battle his or her way to earn the rank of Super Star. To do so, they must fill their stamp card with Star Stamps. The Star Stamps are Wit, Kindness, Strength, Love, Courage, Beauty, and Mischief. The trend the game will follow is Battle Royale, Duel, Battle Royale, Duel; and this continues until the player's next objective is to earn the Beauty Star Stamp. At this point, the player plays a Duel against Daisy, followed by a final Battle Royale on Waluigi's Island. For the Millennium Star, his original plan was to have a straight run-through of seven (since there are seven Star Stamps) Battle Royale Boards. However, when the Millennium Star is about to stamp the player's stamp card, another character bursts from the castle, saying they deserve this. The two argue, and Millennium Star decides to go to a Duel Board. The player wins (they must to continue) and the other character runs away in disappointment. After the stamp is received, the next Star Stamp is shown and another Battle Royale begins. When the Beauty Star Stamp is revealed though, Daisy makes a sudden appearance before a Battle Royale could even begin. The Millennium Star mentions it, but Daisy strikes a pose causing the Millennium Star to fall in love with her and offers her the Beauty Star Stamp. The player says it is not fair and the two argue. The Millennium Star regains consciousness and says they will go to Backtrack to settle it. Suddenly, Bowser appears and tries to take the stamp but Daisy swats him away in one blow. After the player defeats Daisy, she mopes and runs away. Tumble states Daisy said she has never lost, not even to her father. The player then receives the Beauty Star Stamp. The Mischief Star Stamp is then revealed, but then Bowser appears and unknowingly sends it flying into the castle, declaring the player must battle him to earn it. Everyone notices it is gone, and Waluigi comes out of the castle with the stamp trapped in a cage. Waluigi and Bowser fight each other, but to everyone's surprise, Waluigi wins. He tells the player they will go to Waluigi's Island. Bowser tells the player to avenge him for what happened. Although long time foes, the player silently agrees and chases after Waluigi. After the battle is over, Waluigi is pounding the floor in frustration yelling he won't forget what happened. The Millennium Star gives the player the Mischief Star Stamp. Despite winning all the stamps, the Millennium Star declares there is one person left the player must battle. The player is seen thinking hard of who could it be. Both the player and Tumble are surprised when the Millennium Star exclaims the player must defeat him in Stardust Battle to win. When the player defeats him, they ask to be the greatest superstar in the universe (although ownership of the Millennium Star was the original offer). The Millennium Star startles everyone admitting he isn't the real Millennium Star and flies away in shame. The player drops to the ground in disappointment, unable to believe it was all for nothing. Suddenly, Tumble begins glowing and his dice head opens to reveal a small white star. He explains he is the real Millennium Star, and was watching the player the whole time. After returning the castle and the grounds to its normal state, he promises the player he will make them the superstar of the universe. The credits roll. In the final scene, set in front of the castle, Mario is lying on a folding chair, Luigi and Peach are talking to each other nearby, and Donkey Kong is sitting near the three just watching. In the back, Wario and Waluigi are apparently arguing, Daisy is sitting and watching the butterflies, and Yoshi is in the far back chasing a butterfly. The closing scene is a table with a box with the words "Mario Party" on it. A die (the same color as Tumble's head) is thrown onto the table and the word "END" appears on the lower right corner. Mini-game Mode: Players can play all the mini-games that they have collected here, even secret mini-games, organized by type. Battle Room: A bonus game mode where players can compete in a random set of minigames. Players can choose how many points are needed to win, along with which minigame type will be used. Game Guy's Room: A single player can play all of the four Game Guy minigames, and try to get as high of a score as possible. Mario's Puzzle Party Pro can be played here. The Story Mode must be beaten for this room to be unlocked. Story Mode: A single player can go through the storyline. It is set what boards have to be completed in what order. There are Battle Royale and Duel boards. After each Battle Royale board, the player has to fight a certain character on a duel board for a Star Stamp. If the player is to duel with the character they are playing as, they will battle Luigi instead. Unlike Party Mode and Mini-game Mode, Princess Daisy and Waluigi are unplayable in this mode, instead acting as NPCs. Party Mode: A multiplayer that can go through Battle Royale, Duel Mode, and can also go through settings. The game brings back the original six playable characters from the last two Mario Party games and introduces two new characters, Princess Daisy and Waluigi. However, they can only be playable in Party Mode and Mini-game mode. *Luigi steps in as the opponent if the player is playing as the specified character. 1Character is not playable in Story Mode. Just like Mario Party 2 did for Mario Party, Mario Party 3 referenced and took gimmicks from Mario Party 2's boards to use in its own boards. For example, Waluigi's Island uses the main gimmick from Space Land, along with a gimmick from Luigi's Engine Room from Mario Party; in one island, when a total of 5 Happening Spaces have been landed on, all players will lose all of their coins (Space Land), and all islands and routes contain Red Warp Pipes that lead back to start, at the Green Warp Pipe (Luigi's Engine Room). Chilly Waters This ice-themed board has the players get twenty Coins for them to purchase a Power Star from the Millennium Star. While the players are trying to complete this task, they are faced with the two most prominent features of this board; the Action Time, and the ice-y five-way junction in the middle. The Action Time on this board will be triggered if a player lands on a Happening Space on either the board's leftmost column, or on the board's uppermost row; it may also be triggered if a player passes by Mr. Blizzard on the uppermost row. If a player manages to wake Mr. Blizzard up when passing by, he will ask the player to pay him five Coins for him to initiate the Action Time. The Action Time of this board includes Mr. Blizzard rolling a snowball leftwards (then downwards), or rightwards (then downwards). If the player hits in time, he/she will jump over the snowball; however, if they don't, they'll be chased by the snowball. If two players are standing on the ice-y five-way junction at once, then the ice will crack. When the ice cracks, the players who are standing on the cracking ice will flee to the southeast corner of the board. Deep Bloober Sea This undersea-themed board has the players get twenty Coins for them to purchase a Power Star from the Millennium Star. There are three notable features of this board; the two Action Times, and the two Happening Space-heavy pathways in the middle. One of the Action Times on this board is triggered when the player is trying to pass by the junction placed in the middle-left part of the board. When it is triggered, the player has to choose from an assortment of four buttons. If the player chooses the incorrect one (the incorrect one is randomized), they will have to take the path they did not choose; however, if the player chooses a correct button, they will be permitted to go on the path they originally chose. The other Action Time is triggered when a player lands on one of the Happening Spaces that are on the top-left corner of the board. When it is triggered, an arrow will rotate to select a random direction. After that, the player has to escape being sucked in by a Blooper by repeatedly pressing . If the player fails, then they will be launched in the direction the arrow is pointing. When a player lands on a Happening Space on one of the two Happening Space-heavy pathways in the middle, they will be grabbed by Blooper. Blooper will then place the player on the other pathway that is parallel to the pathway that the player was on. Spiny Desert This desert-themed board has the players collect twenty Coins for them to purchase a Power Star from the Millennium Star. The most prominent feature of this board is the fact that there are two Millennium Stars: one that is a mirage (a fake), and one that is real. There is no way to differentiate the two from each other. When a player passes by the mirage, it will vanish. Another notable feature of this board is the two quicksand pits that are located on the lower-middle part of the board and the upper-middle part of the board. When a player lands on a Happening Space that is located around the perimeter of either quicksand pit, the quicksand pit will inhale all players standing on said perimeter. The other quicksand pit will then eject said players so they land on it's perimeter. The Action Time of this board is triggered if a player chooses to pass the path with two cacti. The player has to hit with correct timing in this Action Time. If the player fails at doing so, then either cacti will send the player bouncing away in another direction. Woody Woods On this forest-themed board, players have to procure twenty Coins for them to purchase a Power Star from the Millennium Star. The most prominent event on this board is the arrows that are in three of the junctions in the forest. Whenever a player passes such junction, he/she is forced to walk that way. At the end of every turn, Monty Mole will change the direction of all the arrows on the board. A way for players to manipulate the arrows is to pass by one of his army-like huts and pay him five Coins for him to flip all arrows on the board. Another way for players to manipulate the arrows is to land on a Happening Space that is placed directly before a junction with an arrow. This will only flip the arrow in front of the player. The Action Time of this board is Woody. When a player lands on the Happening Spaces in front of him, he/she is given five seconds to choose from either a Plus Coin Fruit (which will give the player five Coins), or a Plus Block Fruit (which will make the player roll the Dice Block a second time). Action Time also happens when a player lands on a Happening Space at Warukio. He will make the player choose from one of these two fruits: a Minus Coin Fruit, which will take away five Coins from the player; or a Reverse Block Fruit, which makes the player roll a Dice Block and go in reverse. Creepy Cavern On this cavern-themed board, players have to collect twenty Coins in order for them to purchase a Power Star from the Millennium Star. The most prominent feature of this board is Whomp. He is located at the middle of the board, blocking a passage to the upper part of the board via the middle-most path. There are two ways for players to make Whomp turn around: giving an Item - randomized each time - to him when passing by; or by landing on a Happening Space that is in front of him. Another notable feature of this board is the two horizontal railways. When a player lands on a Happening Space that is located on one of those railways, a mine-cart will appear. Any players who are placed on said railway will be chased by said mine-cart until the railway ends. Action Time in this board happens when a player passes a Thwomp that is located beside a railway, and pays him five Coins. The event includes the player jumping on a mine-cart (with ) and then riding to the end of the railway, subsequently moving any players who are on the same railway. Waluigi's Island This isle-heavy board has the players collect twenty Coins for them to obtain Power Stars when purchased from the Millennium Star. The two most notable features of this board are the circle at the bottom-middle part of the board, and the island at the top-left corner of the board. The circle at the bottom-middle part of the board has a number, which will always be at five at the start. For this number to decrease, players have to land on the Happening Spaces that are placed on the circle. When this number reaches zero, it will cause an explosion that covers the entire circle. Any players that are caught in the explosion will lose all of their Coins. The spaces that are on the island located at the top-left part of the board will always show what the rest shows, minus the Bank Space. However, instead of always being one type of space, the type of space shown will change from turn to turn. Action Time in this board is triggered when a player is at the four-way junction at the center of the board. The event has the player press to jump on the pad. After landing on the pad, the player is forced to go the way the arrow that is lit-up shows. What happens when the players' hearts and coins are both the same. Duel boards can be played in Duel Mode and Story Mode. Duel Mode can be selected by selecting the red star in the main menu. Duel boards can only be played with two characters. The objective is to defeat the opponent by attacking them with partners. Each player has a heart gauge, consisting of five segments. The game is over when 20 turns end (when '20 turns' is selected in game length) or when one player's heart gauge is empty. If 20 turns have finished, the player with the most hearts is the winner. If heart counts tie, then the player with the most coins wins, but if that count also ties as well, the match is a tie. Players start with one partner and can gain another (or replace one) when they reach their start space, which also gives them ten coins. Partners are given to the player at random using a roulette (on every third return, the player gets a "Lucky Roulette", which slows the roulette, allowing the player to more easily obtain a desired partner). Each partner has a salary where they are paid when the player's turn starts. If a player cannot afford to pay the salary, the partner(s) leave(s). In the middle of every board is Belltop, a mechanical toy. Every time a player passes him, the numbers on his hat goes down by one. Whenever the hat reaches 0, all players go to him and play a duel mini-game. After the winner receives his/her coin prize, the timer is reset to 5. Koopa Troopa 1 2 -1 Mario N/A His attacks aren't very powerful, but he has decent stamina. His low pay is a plus. Standard: He withdraws and launches himself forward. Powered Up: He withdraws, spins for a second creating a yellow effect around him, then attacks. Goomba 2 1 -2 Luigi N/A This familiar, funny guy really packs a punch. Standard: He kicks the opponent. Powered Up: He jumps, spins in the air creating a yellow effect around him, and then kicks the opponent. Toad 1 1 -1 Princess Peach If a player lands on an opponent's Basic Space, no coins are lost. His ability to prevent coin theft is more helpful than you might think. Standard: He hits the opponent with his hammer. Powered Up: He does two fake swings, then hits the opponent, creating multicolored stars as an effect. 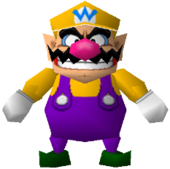 Bob-omb 1 1 -3 Wario Jumps over an opponent's partner and attacks them directly; disappears after only 1 attack, since it explodes. This explosive specialist can jump over your opponent's helpers for a direct attack! Standard: It lights itself and then jumps onto the opponent and explodes. Powered Up: It glows hot pink, then jumps onto the opponent and explodes. Boo 2 1 -3 Yoshi If attacked, will counter-attack for equal damage before disappearing. Will not attack back if hit by a Chain Chomp in its multi-attack if it's not directly in front of the attacking Chain Chomp. This frightening fiend returns any damage you've taken back to your opponent. Standard: It floats toward the opponent and then tackles them. This move creates a heart effect. Powered Up: It appears on the opponent's left, right, and back sides alternately, then tackles with a large heart effect. Snifit 2 2 -5 Princess Daisy Can sometimes give the player two to four coins at the start of a turn. He has well-balanced abilities and can even collect coins, which can be a big help. Standard: He shoots a bullet at the opponent. Powered Up: He shoots a large, blue orb of electricity at them. Piranha Plant 3 1 -5 Waluigi Can sometimes offer extra dice. These dice allow the player to move up to 3 more spaces. He has the strongest attack, and he can sometimes move up to three extra spaces using a special die. Standard: He whips the opponent with one of his vine-like legs. Powered Up: He revs up for a second and then crunches the opponent, creating an effect of a bunch of stars. Chain Chomp 1 2 -6 None Attacks opponent and all partners simultaneously. This monster's mighty attack damages all members of the opposing team. Standard: It rips through the opponents very quickly. Powered Up: it grows to the size of a Chomp Shark, jumps up, and then body slams all opponents. Thwomp 0 2 -4 None Although it has zero attack, it can attack partners and defeats them instantly; but does nothing to the opposing player. He can take out your opponent's partner in one blow but won't touch your opponent. Standard: He crushes the opponent by falling on them. Powered Up: Albeit redundant with the regular attack, he pounds on the opponent four times, with the last time creating a rainbow star effect. Mr. Blizzard 1 3 -2 None Attacks the opponent farthest away from him. He lobs snowballs at the most distant opponent, and his stamina makes him a reliable partner. Standard: He lobs a snowball at the farthest opponent. Powered Up: He lobs a much larger snowball that breaks into small ice pellets that rain down on the opponent. Baby Bowser 1 1 -3 None Sometimes changes into Bowser and does triple damage; if transformation fails, no damage is taken. The probability of transformation success is 40%. Usually he's Baby Bowser, but he can transform into Bowser himself to cause triple damage! Standard: If successful, he turns into Bowser and tackles the opponent. Powered Up: Bowser will breathe fire onto the opponent. If the player gets 2 of the same partners, the Millennium Star will call it a glorious (_____) (fill the blank with the partner). It also raises the attack by one (with the exception of Thwomp and Whomp, whose salaries are decreased by one instead). The following combinations will cause the Millennium Star to comment on it, but the attack won't be raised. Whomp and Thwomp make an earth shaking combination! Toad and Koopa Troopa make an economical pair! Mr. Blizzard and Snifit make a long-range pair! Boo and Mr. Blizzard make a chilling combination! Bob-omb and Chomp make a dangerous duo! Items appear only on Battle Royale boards. They can be bought at an item shop or obtained on an Item Space. Either Toad or Baby Bowser runs the shop, both selling different items. Some items can only be collected through an Item Space. Mario Party 3 allows the player to carry three items at once, as opposed to the single item the player can carry in Mario Party 2. Exclusive to the PAL version is a language select, which allows the game to be played in British English, European French, German or Castilian Spanish. The screen first appears when turning on the game for the first time. can be held down before turning on the console to force the screen to appear after the first time. For this subject's image gallery, see Gallery:Mario Party 3. Fighting Spirit - Theme used for minigames with intense themes: Bowser Toss, Snowball Summit, Vine with Me, etc. Panic! - Theme used for minigames involving evasion: Boulder Ball, Tidal Toss, etc. Super Mario Bros. 3: Part of the music track "What to Do?!" (played in minigames like Treadmill Grill, Spotlight Swim, and Locked Out) is a rearrangement of the Super Mario Bros. 3 castle theme. Dr. Mario: The minigame Mario's Puzzle Party plays similarly to Dr. Mario. Mario Party/Mario Party 2: The character mugshots of Mario, Luigi, Peach, Yoshi, Wario and Donkey Kong are reused in these games. Also, in the Mini-Game Mario's Puzzle Party, these characters have the same winning mugshots from Mario Party 2. Mario Party 3 received mixed to positive reviews. It has a 74% rating from Metacritic, based on 12 reviews, and a 73% from Game Rankings based on 17 reviews. IGN gave it a 6.4 and GameSpot gave it a 7.5. In Japan, Famitsu magazine scored the game a 31 out of 40. N64 Joe Fielder, GameSpot 7.5/10 "While pure innovation may not be king in the Mario Party world, Hudson's dedication to solid, addictive puzzle gaming that makes for a wholly enjoyable multiplayer experience is apparent. Mario Party 3 is fun, different enough from the early games due to the duel mode, and full of enough value to make the purchase worthwhile, even if you now play the other two. Still, it's clear that Hudson has probably exhausted the possibilities for this kind of game with Mario Party 3 and that the premise is beginning to wear a bit thin. Nintendo might want to let Mario take it easy for a while--to take a break from this life in the fast lane and go back to more leisurely pursuits, like playing more golf or tennis." N64 Jason Venter, Honest Gamers 3/5 "All things considered, Mario Party 3 is a solid entry into the franchise. It has some good innovations that almost worked, and nothing that counts against it is really a crippling blow. At this point it might be best to wait for Mario Party 4, which hopefully will fix everything to perfection. But if you find this on store shelves--and you're likely to; I still see it around--you wouldn't do badly to pick it up, especially if you like to party." N64 Fran Mirabella III, IGN 6.4/10 "I can't say I was thrilled with Mario Party 3 at first. I made the fatal mistake of trying to give the single-player story mode a chance. It's a decent way to practice, but it's INSANE as to how much watching you do. You even WATCH your opponents play mini-games all the time. Also, moving around the board becomes very tedious and boring quite quickly. So, as far as single-player goes, I think it'd better be classified as a tutorial mode. The multiplayer mode is where all the fun lies. Gather up three guys around the office, throw in some unsaid aggression, and the fun factor immediately goes up. This is what Mario Party has always been about. So, while there's nothing really new about the franchise there are 70 brand-new mini-games. For me, it makes a very worthwhile rental with some friends. I would only consider buying this if I had three siblings who were addicted to the N64 or had a family that would benefit from it. I suggest you take the same approach." Mario Party 3 is the 26th best selling game for the Nintendo 64, selling approximately 1.9 million copies: 1.02 million copies in Japan, 720,000 copies in North America, and 160,000 copies elsewhere, as of December 31, 2009. 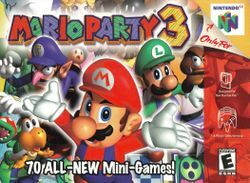 The Mario Party 3 installment won the Console Family Award from the Academy of the Interactive Arts and Sciences of 2002. On the game's cover artwork and wallpaper featuring the entire cast of characters that has an example of a Battle Royale Board Map which is based on Chilly Waters, the spaces illustrated are circle-shaped like the previous games, yet in the game they are octagon-shaped. Upon failing an Item minigame in the Japanese version, the announcer says "MISS!" with said word also shown on screen. This was changed in the North American, Australian, and European versions to say "GAME OVER" instead, but retaining the original narrator's voice recording from the first game. The instruction manual incorrectly states that Thwomp has an attack stat of 2 instead of 0. This is the final Mario game to be released for the Nintendo 64 in all regions except Australia, where that title goes to Paper Mario. Mario Party 3 is one of the few games in which Mario speaks in coherent sentences; this happens when he challenges the player for the Courage Star Stamp. This page was last edited on April 17, 2019, at 17:54.